Aizawl, Sep 18 : The Mizoram government has warned of taking action against its employees who are participating in an agitation launched by the church and some NGOs against the opening of wine shops in district headquarters across the state. While the state government 'partially' lifted the prohibition in February this year allowing the Mizos to buy six liquor bottles a month, the churches had been opposing the government's decision. Secretary for the general administration department, Lalrinliana Fanai, issued an office memorandum on September 14, warning government officials indulging in protests. The office memorandum said with the implementation of Mizoram Liquor Prohibition and Control Act, 2014, NGOs and church organizations have been organizing protests against the opening of liquor shops/warehouses in their localities, hampering smooth implementation of the MLPC Act, 2014. "It has come to the knowledge of the government that some government servants are known to have indulged in such protests, which is against the policy of the government," it said. It added that such an act of protesting against government policy is a clear violation of Rule 3(1)(iii) and Rule 9(i) of the Central Civil Services (Conduct) Rules, 1964. The office memorandum said indulging in protests against the government policy was also an act unbecoming of a government servant. The state government has instructed all government employees to refrain from indulging in such kind of protests. "Appropriate action shall be taken against any government servant found to be acting in contravention of the CCS (Conduct) Rules, 1964," the memorandum said. The MLPC Act, 2014, enacted by the state assembly last year, was implemented on January 15, 2015. 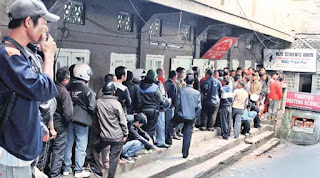 The first wine shop was opened in Aizawl on March 16 amid protests from churches and some NGOs. The new Act replaced the stringent Mizoram Liquor Total Prohibition Act, 1995, imposed in the state since February 20, 1997. Though the newly-enacted law was still a 'prohibition act', consumption of liquor was no longer an offence as was during the 17-year imposition of the previous dry law. Anyone above the age of 21 who wants to drink has to apply for getting a ration card-like document that would enable him to purchase a maximum of 6 bottles of liquor a month. The local churches continued to target opening of new wine shops in their jurisdiction till date, resulting in hampering implementation of the MLPC Act. Sick PSUs under the state government were given wine shop licences to help them tide over their financial problems. Some private parties were also given the same. Despite strong opposition from churches, about 17 wine shops have been opened in the state till date.